From left to right: A Bamboo & Modal blend Sleeveless Coral Fantasy Blouse made in Italy; 100% Linen Red Long Skirt; a Nature inspired Bronze Necklace with a Rabbit Pendant handcrafted in Italy. Very spacious two handles genuine soft leather medium size Black handmade bag from Florence Italy. With straps closure, a smaller zipped compartment inside. 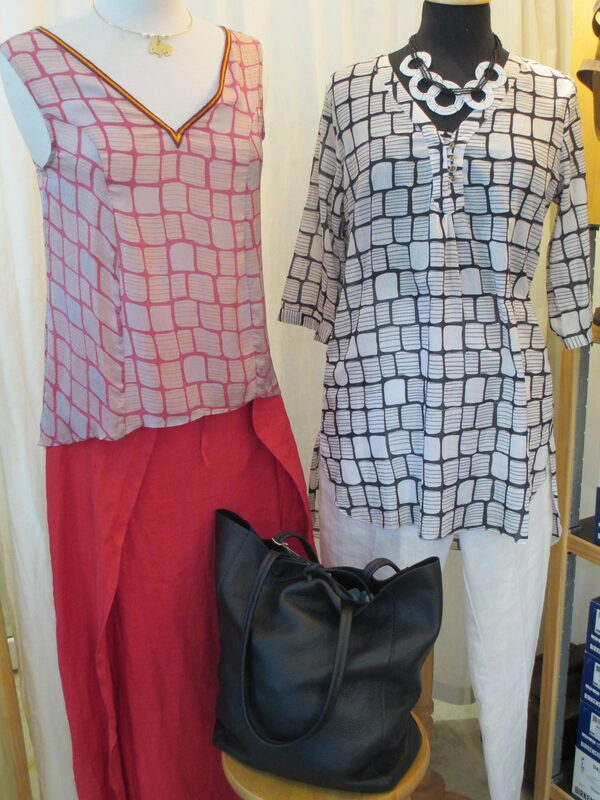 A 100% Cotton Black Fantasy Design Tunic; 100% Linen White BICE Long Pants with a Black & White BATELEUR Necklace made of recycle glass, design in Milan Italy and Handmade by Maasai Women in Tanzania. ← New Nature Inspired Handcrafted Jewellery from Italy!